Schwann cell generation starts with differentiation of neural crest into Schwann precursor cells, followed by their maturation into immature Schwann cells. Schwann cells progressively sort axons from the main bundle; the Schwann cells which associate with a single large-diameter axonal segment become myelinating Schwann cells. In contrast, immature Schwann associated with several small caliber axons become non-myelinating Schwann cells. Each myelinating Schwann cell forms a myelin sheath around the axon, known as a node of Ranvier. This structure allows the action potential to jump from one node of Ranvier to another. 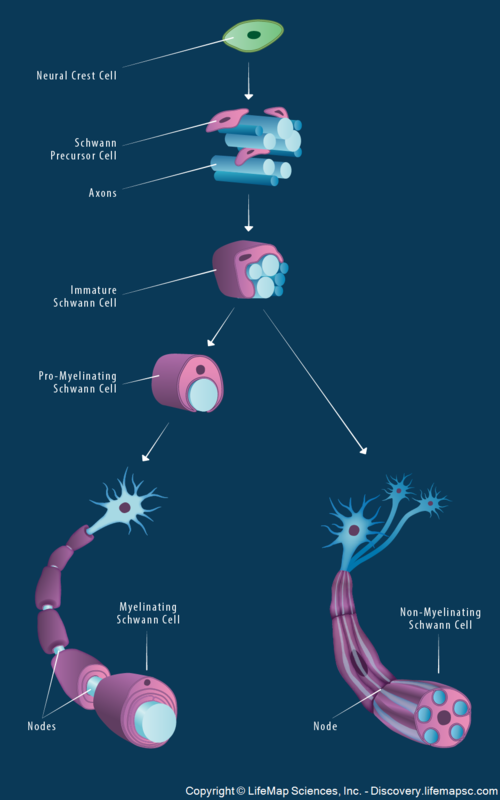 The non-myelinating Schwann cells are important for providing support and nutrition to the axon, ensuring their survival.